The inside material of the shoe’s upper was comfortable for runners because it didn’t cause any irritation, even when they didn’t wear socks. The testers appreciated the appealing look of the New Balance Minimus 10 v4. As commented by users, this one was suitably lightweight as a minimal trail running shoe. The general consensus about the mid-sole was that it was comfortable. One reviewer stated that this model was great on soft surfaces such as sand and mud, and perfect for obstacle courses. Runners noted that the sole unit was strong enough to withstand impact and surface friction. There were testers who felt that this shoe’s platform was built higher than its predecessors, which removed the minimalist vibe. Some users stated that the toe box was too narrow that it rubbed against their toes uncomfortably. There were those who didn’t like how part of the tongue was attached to the interior sleeve; they felt that it cut into the skin of their ankles. The heel section of the upper unit wasn’t able to secure the foot in place, complained a reviewer. Several runners reported that the mid-foot and rear sections of the upper unit were too loose; their feet kept sliding around in the foot-chamber. A couple of consumers stated that the color schemes were bland and boring. The flexible New Balance Minimus 10 v4 is an update that carries on the legacy of its well-received predecessor in the series. Its lightweight nature was able to allow runners to take on the trails with ease and comfort, but there were those who didn’t acclimate well to some of its components. A number of consumers felt that it wasn’t as efficient as the previous iteration. But many still believed that it’s still a solid option for trail adventurers who desire a lightweight ride across the outdoor topography. Because of the harsh conditions that my running shoes are exposed to, I am quite picky about the shoes I chose. I often spend hours searching through reviews and specifications to find the right shoe, and I also like to avoid overbuilt running shoes. So in the end, there is a very small list of shoes that I like. During one of my many hours of shoe searching one day, I came across the Minimus 10 v4. It has a good solid sole with pyramid shaped rubber for grip. This is to be honest isn’t that grippy in wet conditions but because I am running on the road as well, it means that they don’t wear down so quick and are a lot more comfortable. My first run in these shoes was actually 50km on the road. Because they are called trail shoes, I was a bit worried as to whether or not they would be comfortable enough to run that far. I was pleasantly surprised when they didn’t cause any pain. These shoes have more cushioning than the previous models. This is something which some people dislike, but everyone to their own opinion. I personally found the thicker foam made my runs on the road a lot more comfortable. I found that even though the tread is no that prominent, it still gripped the trails enough for my liking. This shoe weighs a little more than its predecessors because of the solid rubber sole, but it is not enough of a difference in weight for you to notice it. This shoe is a great all round shoe and can be worn without discomfort in bare feet. Overall, I think that this shoe is great for anyone doing any distance on any surface. This shoe hugs tight to your foot so it is also great for any workout that involves any side to side sort of movements. Probably the best thing about this shoe is that it teaches you how to have a great form, which not only benefits your running but your overall form. The reason for this is the minimal cushioning underfoot which forces you to run striking the ground with you toes first, which in turn lessens the damage to your joints. This basically puts the shoe in a very similar profile to the MT110v1 and I for one am glad to see a more minimal option being offered by NB when many companies aren’t even putting out a trail shoe lighter than 9 oz. The 7.2 oz, 4mm drop Minimus Trail receives a major update with the incorporation of Revlite midsole material, a switch from a gusseted to a burrito tongue, and a softer, more open forefoot. With a sleek fit, slightly more cushioning and a natural fit and feel, it won’t hold you back as you explore the trails in comfort. The New Balance Minimus 10 v4 is a running shoe that’s meant to cater to the needs and performance desires of minimalist trail runners who don’t need the extra bulk or stiffness of most trail shoes. This model looks very appealing and would even pass easily as a casual shoe because of its modern design. The low-profile construction stands true to its minimalist roots. The upper unit uses durable mesh, which is made from synthetic components. It doesn’t easily tear apart or lose structural integrity, so it’s going to remain strong and efficient, even after many uses. A seamless construction removes any unnecessary layering or stitching, which may add more weight to the shoe. It also allows the runners to use the shoe without socks. Responsive cushioning is handled by the RevLite foam technology. This lightweight material doesn’t have a bulky look. It allows the foot to move naturally because of its flexible nature. The foot bed adds a bit more cushioning. It’s even treated with an antimicrobial coating to maintain a clean and a healthy interior environment for the runner. 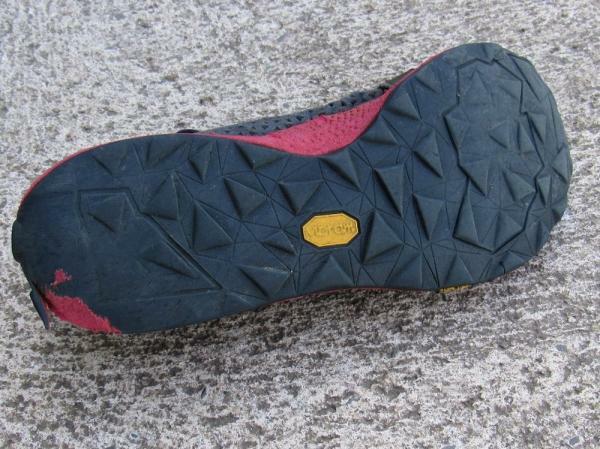 Vibram is one of the industry-leading outsole components on the market. Made from durable materials, it makes sure to shield the mid-sole from the potentially damaging effects of surface exposure and friction. Triangular gripping lugs assist the runner in holding onto various types of surfaces. The New Balance Minimus 10 v4 has a standard running shoe length. It uses regular measurements for length, so men and women can easily get the right size. The available widths for both genders are medium and wide. Its semi-curved shape is friendly to the natural curvature of the human foot. The Vibram outsole material is placed across the entire length of the external side of the platform. It shields the mid-sole from wear and tear. It also gives reliable surface traction, which is important when tackling the outdoor surfaces. Triangular gripping lugs allow the runner to hold onto multiple types of ground. They face different directions to assist in upward or downward traversals. The RevLite foam is a high quality material that runs the entire length of the New Balance Minimus 10 v4. It’s lightweight, so it won’t let the runner feel as though their feet are being dragged down by their shoe. Responsive cushioning is given to the runner, making sure to keep their feet comfortable throughout the phases of the gait cycle. The foot bed adds a bit of cushioning to the underfoot. It’s treated with an antimicrobial coating to stave off odor-causing bacteria. Synthetic Mesh is used in the upper unit of this running shoe. It is lightweight and breathable, so air is able to keep the foot cool and dry throughout the running session. The seamless construction of the upper does away with any stitched sections or unnecessary layers. It’s a design that prevents skin irritation. This barefoot-friendly design allows the wearer to use this shoe even without socks.